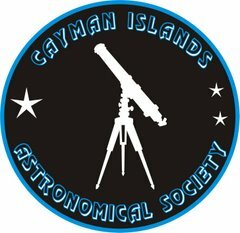 The Cayman Islands Astronomical Society will be at The Marriott Hotel again this Friday night 5th August for a promotional “Dark Night” evening. (weather permitting) . But please park outside and walk in. In the event of being more than 50 percent cloud the meeting is cancelled. We have 5 visible planets in the sky at the moment – these should be visible form both our venues this weekend. The Pedros Meeting will however allow us to see the famous “Teapot” Asterism- and within the “steam” from the spout -the Centre of our Milky Way Galaxy. This month also brings us the Perseid meteor shower which always brings huge interest from the Press.I don’t want to discourage people but here in Cayman our latitude means we don’t quite get the full effect of more Northern Latitudes. 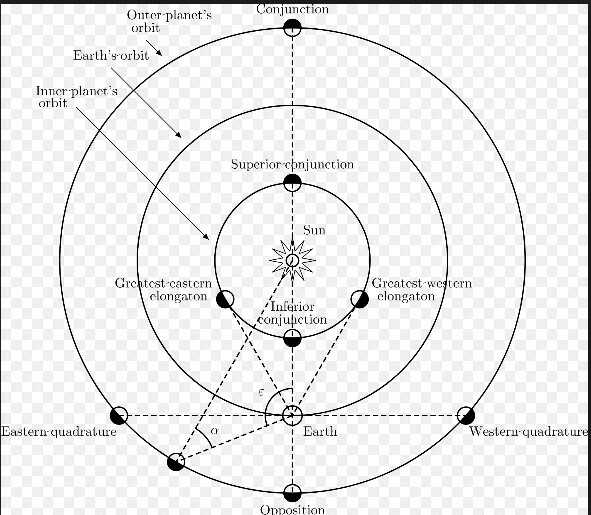 The figure normally quoted is an estimated Maximum figure assuming excellent visibility and No Moon with the Radiant- he portion of sky where the meteors appear to radiate form (from the Constellation of Perseus) directly overhead. This year its predicted to be 300 meteors per hour between Aug 11 and the 13th . Its also best to see the shower AFTER midnight – 2AM for example is a good time- as the Moon which is almost full sets at 1 AM on the 12th . Good Luck! The next General Public STAR WATCH meeting will be at St Pedro’s Castle on Thursday Feb 11th – starting at 7 PM. Usual rules apply with regard to the weather- if more than 50 percent cloudy then the meeting will be cancelled – you may phone me (not text) – 925 7657 at around 6:45 PM for an update if there is any uncertainty. Non-members are asked to park outside and walk in. March 10th Meeting at Pedro’s with Savannah Primary School. The Morning Skies in February are very much the realm of the planets. Currently all 5 planets visible with the naked eye can be seen. Although as one smart alec has pointed out – the Earth is also visible too. The diagram shown below is a reasonable example of what can be seen – although in Cayman the line of the planets is much higher in the sky – almost overhead. . Notice Mercury and Venus- as the month progresses Venus will get closer to Mercury – but the best date to catch them is probably Feb 6th when a slim crescent moon will sit between the two planets. It’s going to be interesting to watch the motion of the planets across the sky this year. 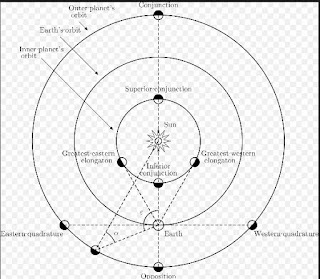 Firstly we have all the visible planets in one place! The last time this happened was in 2005 over 10 years ago. We are indeed lucky with Mercury as it’s normally very elusive but it will be visible for quite a while slipping back into the dawn at the end of March. Mercury will reappear as an evening object in April – and again does another “dance or loop” in the sky before returning sunwards in May when on May the 8th the planet orbit is so aligned we will be able to see the disk of the planet crossing the Sun, - a type of eclipse called a Transit. More in this in later newsletters. 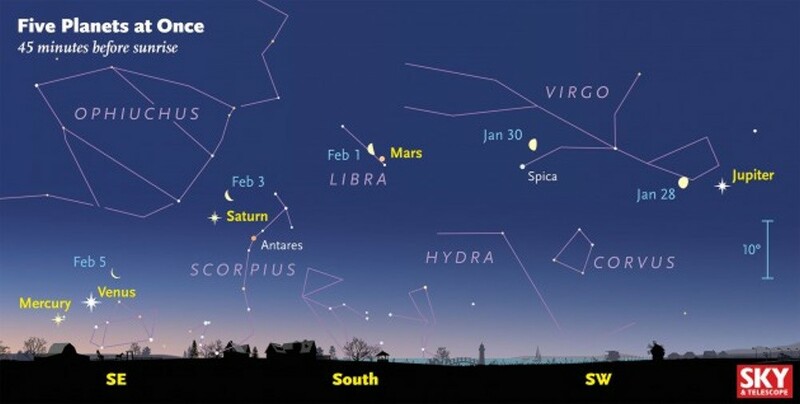 As we turn our gaze towards the outer planets – Mars, Jupiter and Saturn, all will be visible in our Summer evening skies, special mention to be mad of Mars as it will be the closest to the Earth (at its Opposition) since 2014 . It will be even bigger and brighter in 2018! Now we turn to the evening sky. Sunset on the 11th is around 6:20 PM – the chart below is for 8:30PM and is taken from the excellent site Heavens-Above.com. The time shown is later than normally used in the newsletter but I wanted to show that at long last Jupiter is coming back to the evening skies. Certainly I am hoping we will catch it at the Red Sky at Night Event. 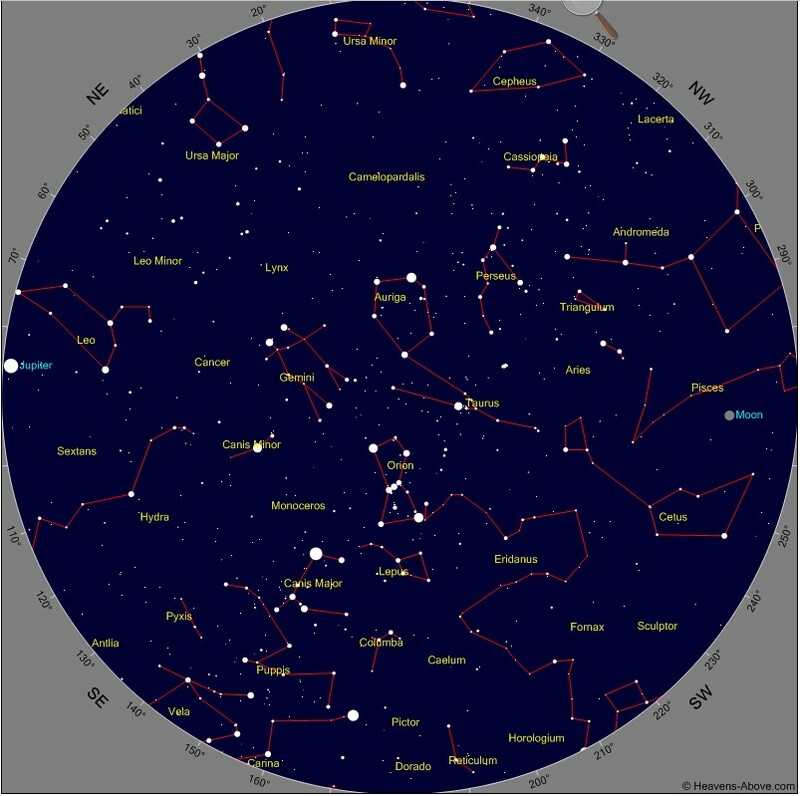 Heavens-Above.com is a great site for satellite predictions too- there will be some crossings of the International Space Station towards the end of the Month (around the 20th) which I will post up on the Facebook page. 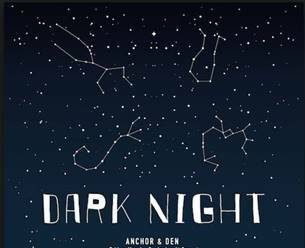 Finally I have always been intrigued at just how far we can see into the “Southern Skies”- The Southern Cross for example has been visible recently in our Morning Skies – and in April/May/June we get a great viewing of it again in the Evening. One Southern Sky object that has eluded me however is just a bit too close to the horizon for us to see clearly. This is the object LMC, the Large Magellanic Cloud. I know our astronomical friends in Trinidad can see this Ok but here… a bit of a challenge. The LMC is a familiar sight to Southern Hemisphere observers- and looks like a small part of the Milky Way that’s slipped away. It is in fact a satellite galaxy to our own Milky Way. Let’s Hope for Clear Skies Everyone!! Don’t forget our Website and Facebook page too.